Nate Good is a 23-year-old Hip-Hop artist from Northern Virginia. Nate released his first mix tape The Jump, in August 2013. From this debut work, DJBooth selected Sugar Water as an editor’s pick and the song went to #1 on the DJBooth Indie Chart. In January, 2014, Nate released the single Cup of Joe which earned another DJBooth editor’s pick as well as being selected by DJBlaze for his Blazing Cuts playlist in January 2013. Nate released his single You & I which was featured at the top of the top-rated features on DJBooth in April 2014. In July 2014, Nate released his mixtape The Remedy as a pre-release promotion to his highly anticipated free album, Black Trucks which came out in August. Black Trucks showcases Good’s abilities as a lyricist, rapper, singer, and songwriter. Once again, DJBooth selected the single Drunk Tears and it quickly made an appearance on the DJBooth R&B Chart. GMAD has posted many of Nate’s tracks and counts itself a fan. They say of Nate that he “has become a GMAD favorite of ours here lately.” The single You & I hit #1 on the GMAD song chart and on April 15 was the GMAD email song of the day. 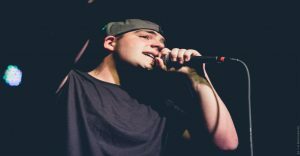 On February 19,2015 Nate will be opening for Bubba Sparxxx in Leesburg, VA at the same venue where he previously opened for Yonas. Nate has also performed on numerous college campuses including Virginia Tech, the University of Oklahoma, and Marshall University. Nate was born in Evanston, Illinois and moved to Virginia when he was eight. He was raised on a steady fusion diet of Motown, the Beetles, classical music, and, of course, finally, Hip Hop. Nate attended the University of Tennessee for a year before returning to Virginia to pursue his career in music. In 2013, Nate participated in the opening of O Street Studio in Purcellville, VA. Nate’s first release, The Jump, was recorded at Depth Charge Studio with Mr. Zechariah Wise. Subsequent releases have been recorded at O Street Studio. In late February, 2015, Nate will begin recording his first full-length LP at ID Labs in Pittsburg with Big Jerm. ← British Rapper “Ocean Wisdom”you should know !! !